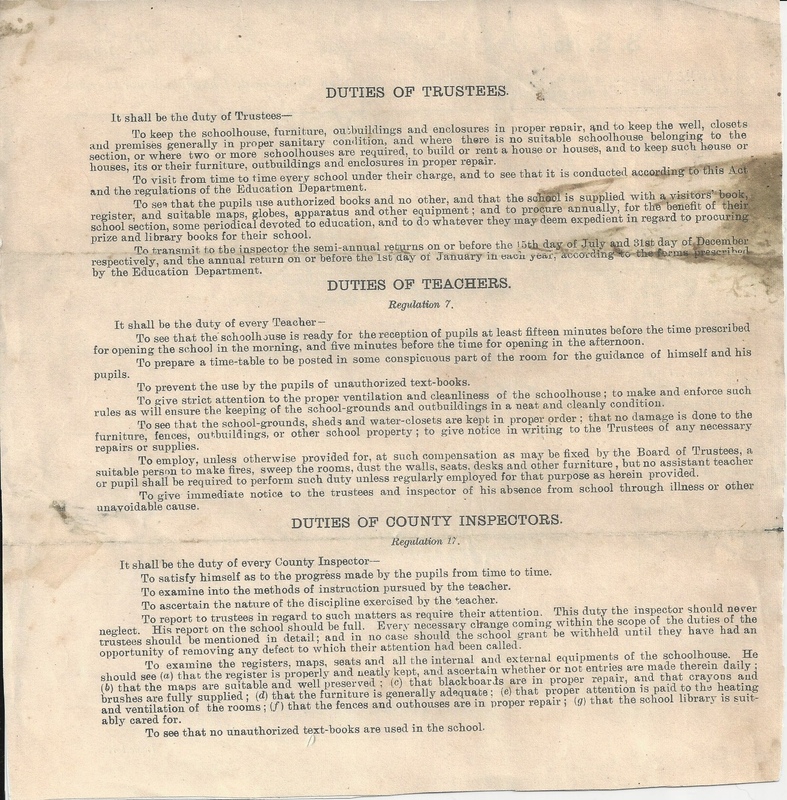 The Reverse of the school inspection form illustrates a list of duties for the school trustee, the teacher, and the inspector. The Trustee’s directions are to make sure that the schoolhouse and furniture are kept in good repair, ensure that the teacher is doing his/her job and using authorized materials, and take the inspector through the school. The teacher has to oversee the smooth daily running of the schoolhouse. Upholding the mandates of the community and the trustee were also very important. Finally, the inspector’s job was to ensure that the students were learning, the teacher was teaching appropriately, the schoolhouse was in good condition and that all materials required were present. The inspector would then report back to the board on the status of his findings. As I’ve never had the pleasure of conducting a modern review of a school, I can only assume that the process is much more detailed now. We have standardized tests to examine student achievement, teams of custodians to monitor school cleanliness, and multitudes of systems (e.g., electrical, plumbing, HVAC) to maintain. 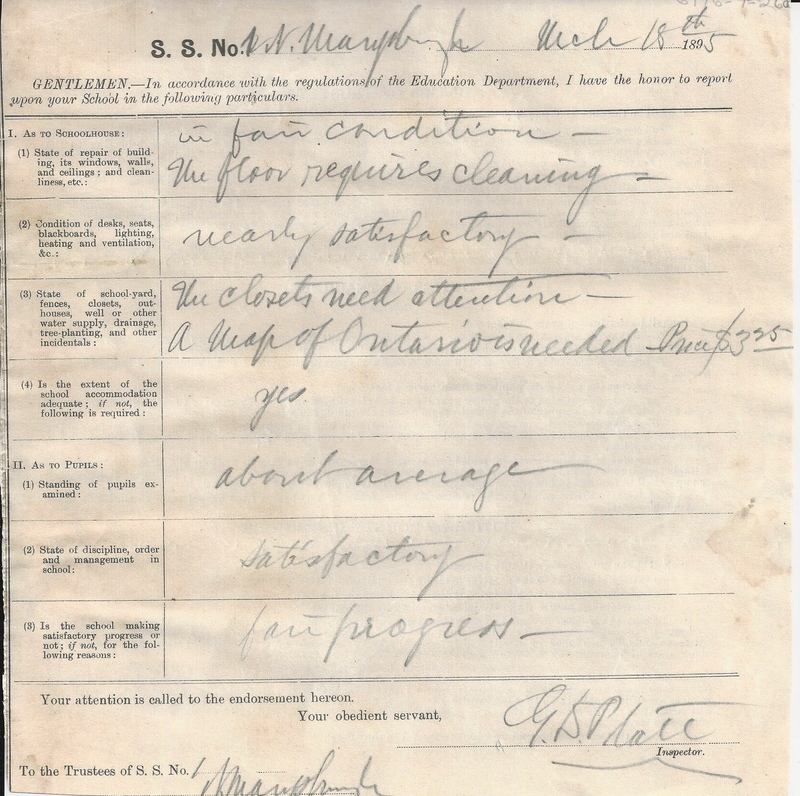 In 1895, the inspector visited a school in North Marysburgh and determined: the floors were a little dirty, the school needed a map, and the closets needed attention. The rest was satisfactory. The cost for a map was $3.75. It’s difficult to believe that a school inspection was that easy (and a large wall map was that inexpensive). 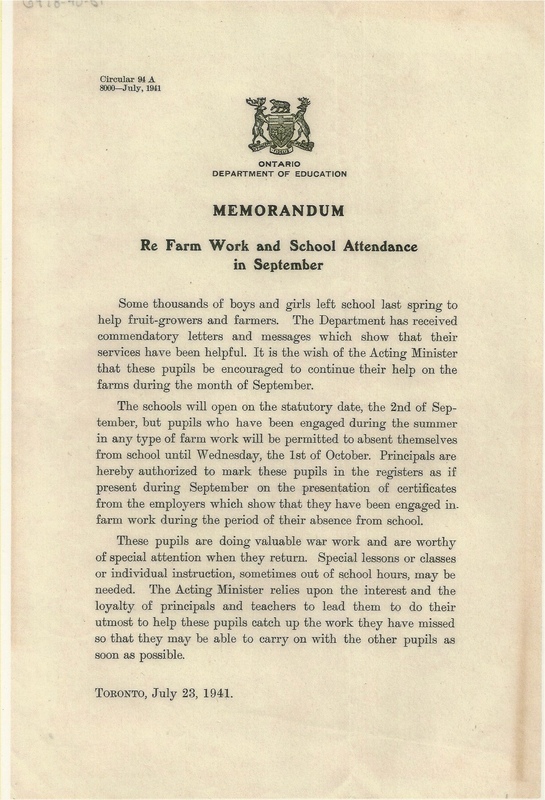 During World War II, the Government of Ontario issued an exception for attendance at schools. Students who worked on farms were allowed to begin school in October, instead of September. The students were commended for their work during the war and their contribution to the war effort. The difficult part for those helpful students would be getting caught up on missed work when they returned to school. That kind of exception must be difficult for modern students to fathom. Provincial attendance exceptions never occur. 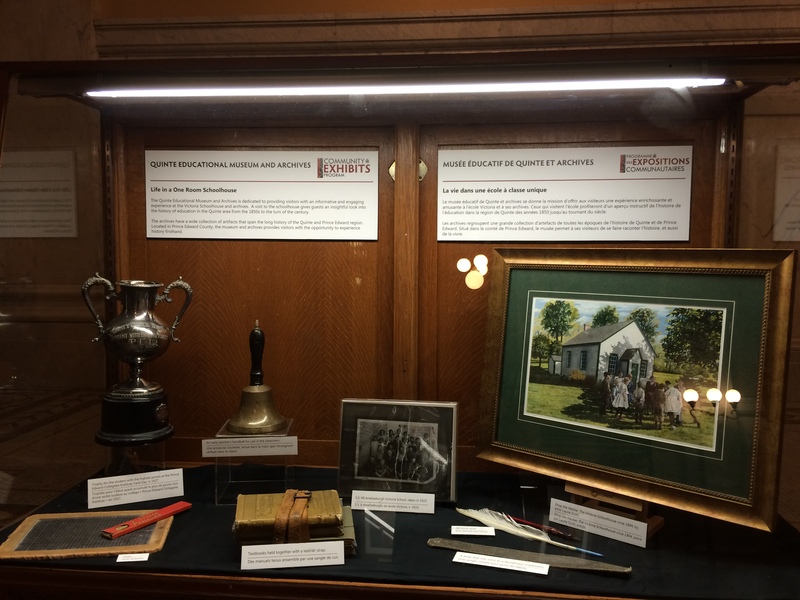 Recently, the Quinte Educational Museum and Archives was given the opportunity to put up a display in the Ontario Legislative Assembly. Our display was part of the Community Exhibits Program, which allows Ontario organizations to showcase some highlights of their organizations. Our display used some educational artefacts and illustrated who we are as an organization. Our Member of Provincial Parliament will be notified of our display and some professional photographs will be taken. If you are near Queen’s Park between now and late November, stop by and take a look at our interesting display! This note is a request to pay a teacher his salary. The salary for an entire year is eighty-seven dollars and fifty cents. Using a rough inflation calculator, it seems that the teacher’s salary would be around $1,989 in modern times. A modern teacher making that salary would live in dire conditions. 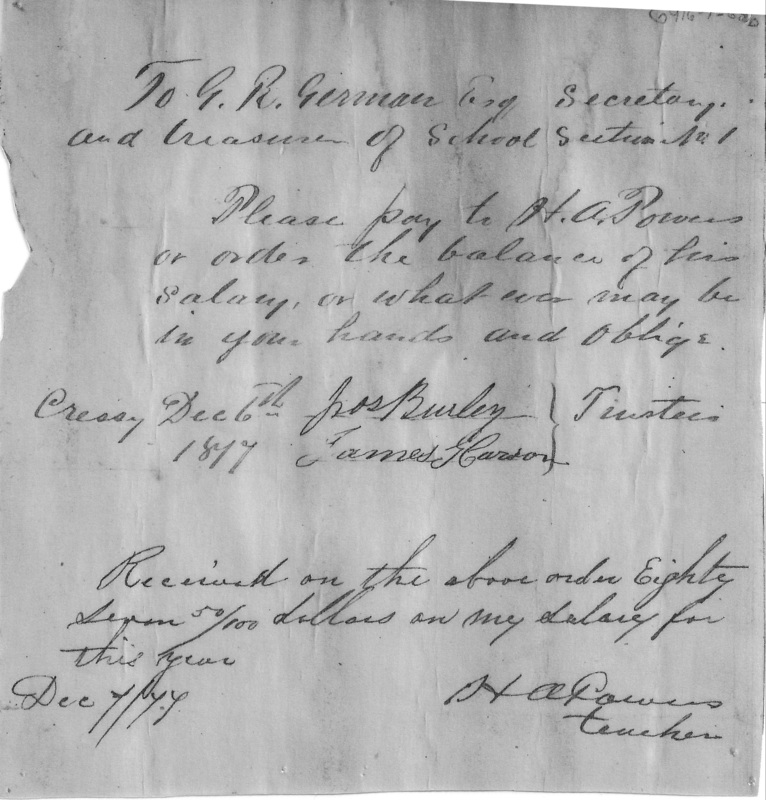 In 1877, the teacher lived with local families and scraped by due to the generosity of the community. What would we do if this was the case now? Would our communities be so generous? A letter of reference looked a little different in 1855. The teacher’s morality and character was discussed. Now, teachers are evaluated very differently. 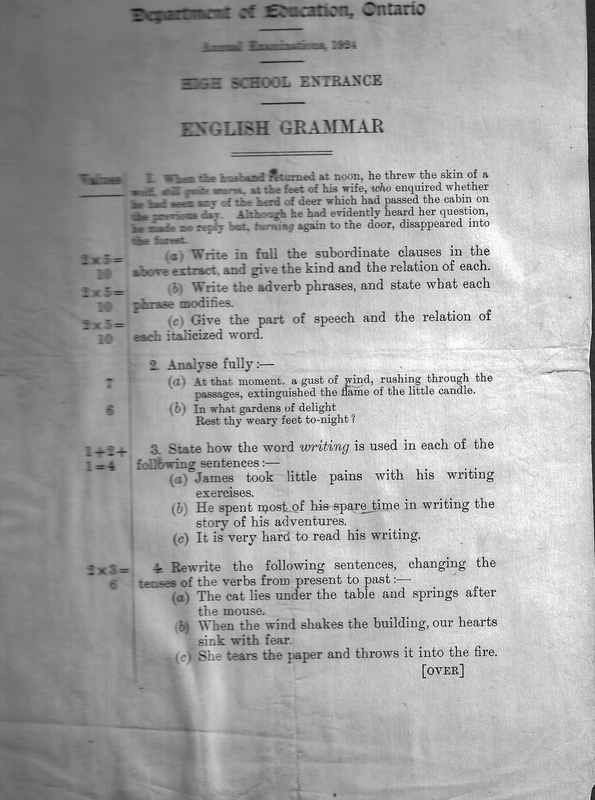 Although the material is a little blurry, this document is a High School Entrance Examination in English Grammar (1924). The column on the left indicates the marks awarded for each correct answer and the column on the right provides the student with questions to answer. When the husband returned at noon, he threw the skin of a wolf, still quite warm, at the feet of his wife, who enquired whether he had seen any of the herd of deer which had passed the cabin on the previous day. Although he had evidently heard her question, he made no reply but, turning again to the door, disappeared into the forest. (a) Write in full the subordinate clauses in the above extract, and give the kind and the the relation of each. (b) Write the adverb phrases, and state what each phrase modifies. (c) Give the part of speech and the relation of each italicized word. How would you have fared on this question? 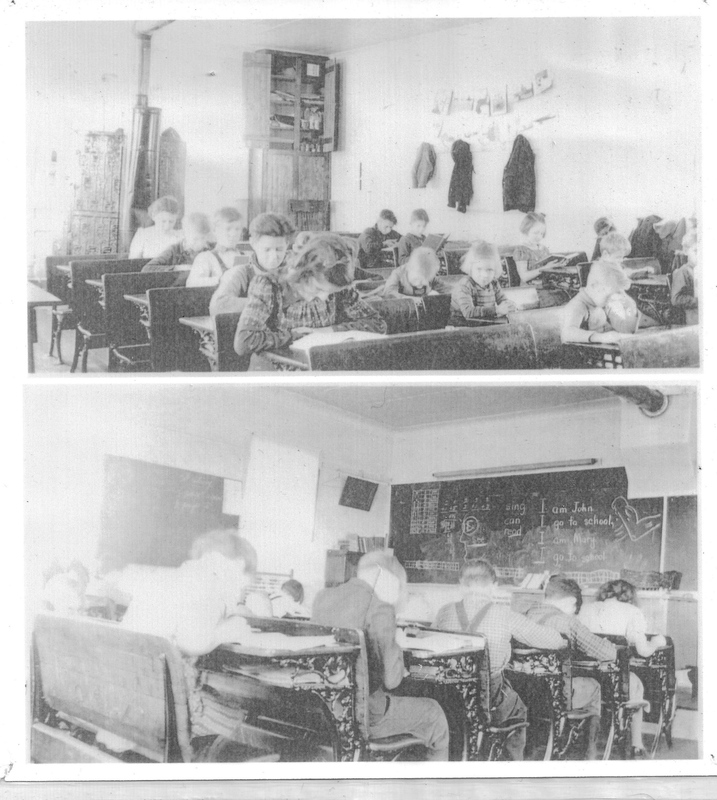 These pictures were taken at S.S.#13, Adam’s School in Ameliasburgh, Ontario, by the teacher – Mr. Donald Johnson. This class is similar to most others in Prince Edward County. The children were different ages, working on the lessons written on the blackboard. Different sections of the blackboard would be dedicated to different grades. The cabinet in the first photo held all of the school supplies. The only heat source for the classroom is the wood stove at the rear of the room and the pipe that crosses the ceiling. Students would have worn heavy clothing to stay warm. The teacher would have also had students rotate desks to share the warmth. Cold temperatures also meant that ink would freeze. The classroom has definitely changed from the early Canadian one-room schoolhouse. 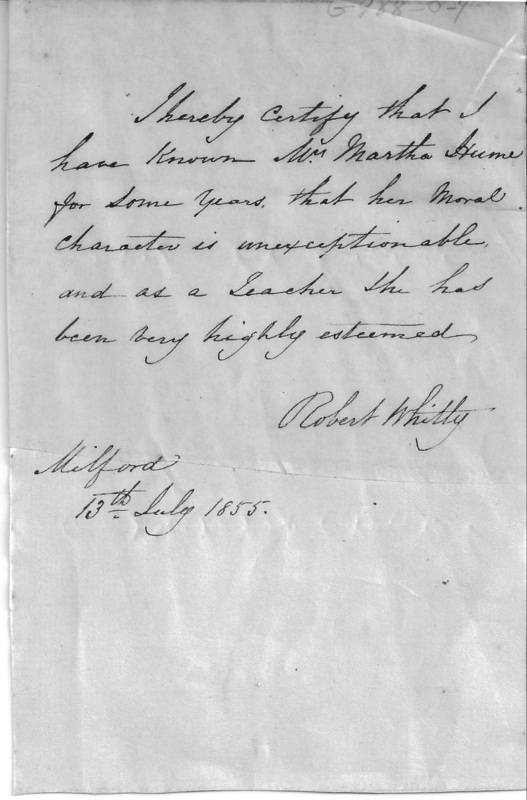 Handwriting was important in 1853. This student practiced the craft and was successful. The script is elegant and the drawings are interesting! 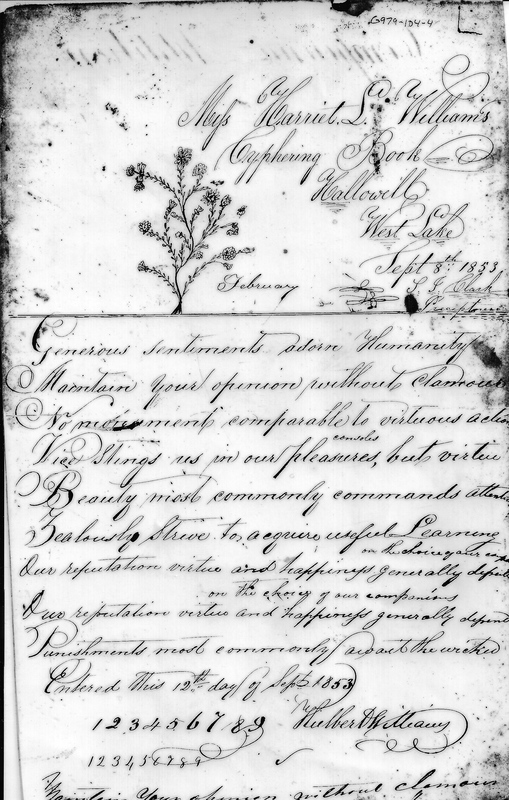 Has technology really eliminated handwriting in the modern world?